AKA William Magear Tweed, Sr.
William Magear Tweed worked at a brush factory, and moved into management after marrying the owner's daughter. He soon became a rising star in New York City politics of the 1850s and a key player in Tammany Hall, the behind-the-scenes group that had make-or-break power over local Democratic Party nominations. By the late 1850s Tweed and his associates controlled the group, and in 1863 he was elected Chair of Tammany Hall. 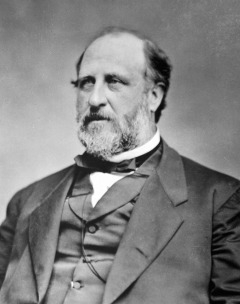 With absolute power over who could be nominated as a Democratic candidate and enormous influence over appointments to office, "Boss Tweed" was himself appointed a Deputy Street Commissioner, and began putting cronies on the city payroll for doing no work. With his substantial kickbacks, Tweed bought several companies which were promptly awarded city contracts. He was elected to the State Senate in 1867, and within months had charmed and cajoled his way to similar near-absolute control over the state's capitol. In famously barbed caricatures, Thomas Nast, cartoonist for Harper's Weekly, was one of the few prominent voices to speak against him, but Boss Tweed's dynasty was brought down from within, when other members of Tammany Hall shared evidence of Tweed's corruption with the New York Times. The Times ran a series of articles exposing Tweed in July 1871, and on 16 December 1871 he was arrested. On 19 November 1872 he was convicted on 204 of the 220 charges against him, and sentenced to thirteen years in debtors' prison. After nineteen months in jail, he was released on appeal, then immediately re-arrested to face additional charges and civil suits. Freed from prison on an 1875 "furlough" weekend, he fled to Spain, where he was arrested as soon as his ship docked. When he was returned to prison in New York, Tweed gave a complete confession to all his crimes in hopes of leniency or a pardon, but his listed crimes were so extensive -- exceeding even what was already known, and implicating many high-ranking officials -- that the state's Attorney General refused to make a deal. He died in the federal prison in New York City. Freemasonry Palestine Lodge, F. & A.M.